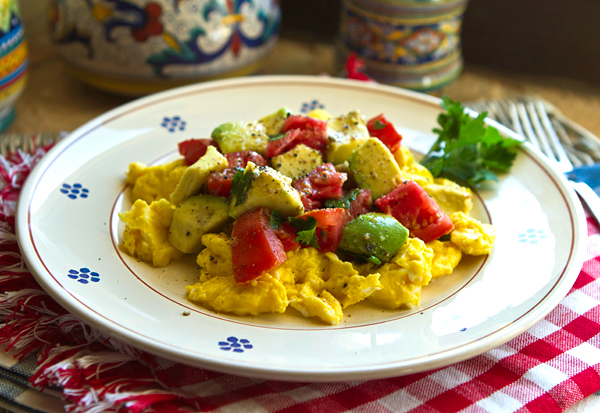 There is nothing as comforting a a plate of warm, creamy scrambled eggs, unless those scrambled eggs are topped with tomatoes and avocados. Although I generally buy avocados quite frequently when we are back in the US, here in Italy, they are just starting to make it into our local grocery stores and even when you do find them, they are generally as hard as rocks. I recently found two really nice, ripe avocados however, and just had to buy them. I used one in smoothies paired with pineapple, and the other I used in this easy breakfast dish. With three chickens, we are lucky enough to get three very fresh eggs daily and I enjoy them fried in a little olive oil, or softly scrambled as in this recipe. 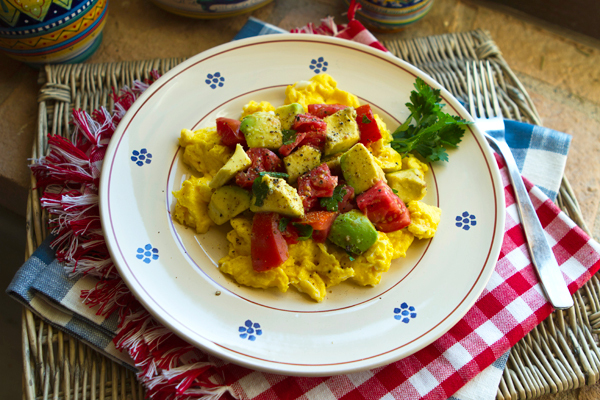 This dish just works really well as the creamy texture of the avocados pairs beautifully with the eggs, and the ripe tomatoes add both flavor and color. I would save this dish for a relaxed weekend morning and serve it with some toasted whole grain bread, though I would also enjoy it as a light dinner option paired with a mixed green salad. Eggs provide a healthy source of protein for breakfast. Cut out the core end of the tomatoes, cut into 1 1/2-inch dice, and place in a bowl. Remove the pit and peel from the avocado and cut it also into 1 1/2-inch dice and add it into the bowl with the tomatoes. Drizzle the lemon juice on top, and season with salt and pepper. Careful toss the avocado and tomato mixture being careful not to break up the avocado. Break the eggs into a mixing bowl along with the milk, parmesan, and a little salt and pepper. Beat with a fork until well mixed. Heat the olive oil in a non-stick frying pan over medium heat, then pour in the egg mixture. Use a wooden spoon to gently move the eggs around in the pan. 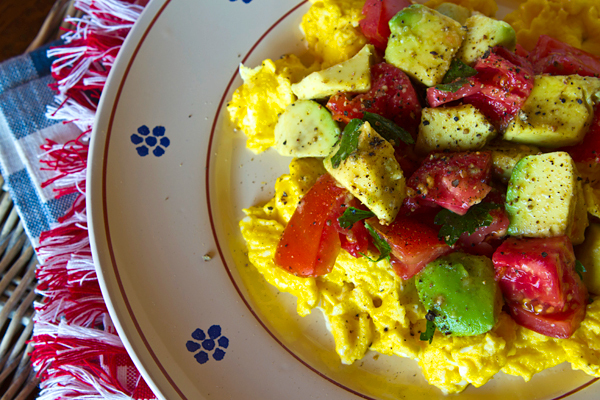 Serve the eggs on two plates topped with the tomato and avocado mixture.